Now that would explain quite a lot on account of what's wrong with this world! Or maybe even a lot of what's right with it. Ironically the only place I can find them is at an international food market. And they're $5 each. 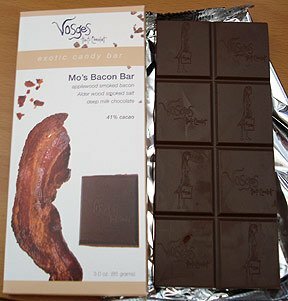 At the Renaissance festival a few years ago they were selling bacon covered in dark chocolate. My husband and I shared a piece. It was so good! Another great oldie, this time from sisters Ann and Nancy Wilson, also known as Heart. It's the only one of their hits where Nancy did the lead vocals, although the video suggests that Ann also sang part of the lead. I don't think I realized that fact about this song. It's a beauty. Thanks, Aragorn. I was looking over the bacon posts. I got my brother a bacon puzzle for Xmas. (Regular puzzle, lots of pieces pictured). This great piece of music has been used in the movie "Eyes wide shut", but nontheless has survived the "abuse". Anyway, I think I'll start introducing something Classical. Lisa Gerrard an Australian genius. I love her music ever since the Gladiator movie. She is using words that are not of this world. This guy has been a significant influence on me as a guitarist, and as I've only recently still discovered, he shared his birthday with me. This song here is from what I personally consider his best musical period. Rest in peace, Gary Moore. Love Gary Moore, Aragorn. He had an all time classic here. The best guitar solo ever! Yes Dreamtimer, there are some artists that cannot be copied by anyone, soooo unique. Love that! That particular guitar solo is indeed a memorable and iconic one, but it roughly centers around the same chord progression as he had already used on a similarly iconic song, with an equally memorable solo. The version here-below is from a live performance with his former Thin Lizzy buddy, Phil Lynott. The studio version of the song has vocals by Gary Moore only, though.